Video: Veggie Tales: God Wants Me to Forgive Them? Objective: All sin but God will forgive us if we ask Him to. How many brothers did Joseph have? How did Joseph's brothers treat him? How do you think this made Joseph feel? 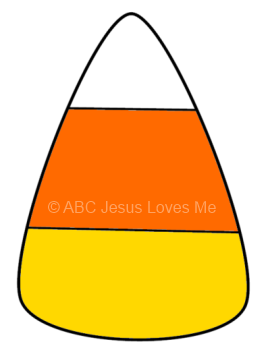 Jesus loves the little ones like me, me, me. Jesus loves the little ones like you, you, you. Information: Write last name on tracing paper. Tell the child: Look at all these pencils. They all are very different: short, tall, thin, fat - different sizes, shapes and colors. Each pencil has one thing in common, though. Each has an eraser for when the pencil makes a mistake. We are like the pencils. We are all different but we all make mistakes. But, we each have an eraser just like the pencil. What is your eraser? (Wait for answers) God is our eraser and He is always with us. When we ask forgiveness, God takes away our sins, just like the eraser wipes away the pencil's mistakes. Directions: Cut out an approximately 2-3" heart cut from construction paper or craft foam. Fold the heart in half horizontally and cut two small slits with scissors to thread the pencil - one near the top & one near the bottom. 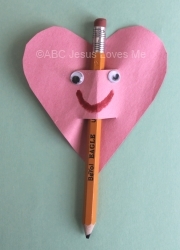 Be careful not to cut the slits too big or the heart will slide off the pencil. Allow the child to decorate the heart to look like a person (googly eyes, mouth, nose). Thread the pencil through the heart. - View Veggie Tales: God Wants Me to Forgive Them? - Paint the Joseph Forgives His Brothers worksheet with a toothbrush. Draw the outline of a person on a piece of paper. Discuss how sin (the wrong choices that we make) clouds up our hearts and separate us from God. Ask your child to provide examples of sins that occurred in the Bible story of Joseph and then write the name of the sin on the figure. 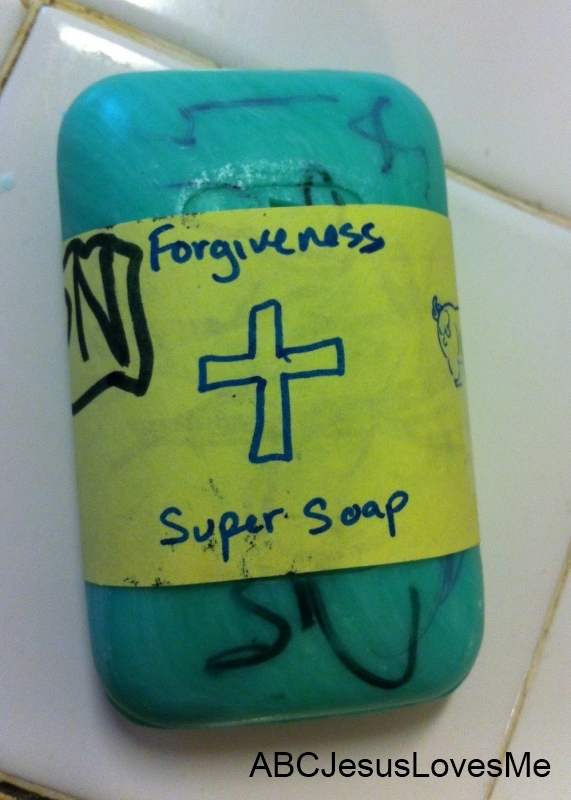 Explain that God's forgiveness, through Jesus, is like super soap that washes away our sins when we are truly sorry and ask forgiveness. Decorate a bar of soap using a piece of paper decorated with stamps, crayons, stickers, or markers. Tape the label on the soap to finish. - Have fun learning "on" and "off" with a flashlight while in a dark closet. 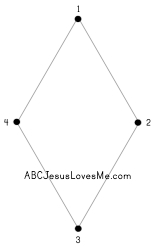 - Week 8 focuses on "angled-line letters" N and M. Start by creating the characters using short and long popsicle sticks and move to writing the characters on the Angled Line Characters #1 worksheet to show the progression of the letters and numbers. Continue to have the child practice writing his last name on 1" Tracing Paper. Slowly remove the red dot, green dot, and then box as the child is ready. - Charming Opal is a story about losing a tooth. Be sure to present this as a fun experience to look forward. 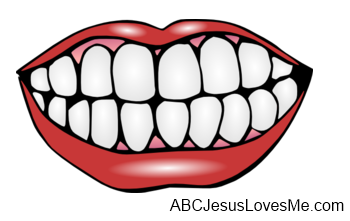 - Paint the Bruth Teeth worksheet using an old tooth brush. Turn an egg carton upside down and sprinkle it with baking powder. Brush the "teeth" clean with a toothbrush and "floss" using yarn. Hide coins or small items in play dough. Using her index finger, have the child find the items. Using her thumb is "cheating" and not working the weaker muscles. This week is the first of many Memory Obstacle Course suggested in the ABCJLM Curriculum. View the video and read the information on the Memory Obstacle Course page to understand the objective and set up. For the first Memory Obstacle Course, focus on letters and numbers using a puzzle or flashcards. Ask the child to bring one letter or number back to you. Diamond Dot-to-Dot Worksheet. Additional worksheets available in the ABCJLM Visual Perception Workbook.